My love for high-quality pocket cameras started back in the mid-nineties, before the digital era. I had a Yashica T4 Super loaded with Fujichrome that I took everywhere. The camera world has changed a lot since then. Camera phones are so good now that point-and-shoot cameras have become a very hard sell. There are still a lot of reasons to have a dedicated pocket camera, though; namely, better image quality, a better lens and better controls. 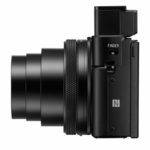 Photographers looking for something to bridge the gap between their smart phone and a DSLR or mirrorless camera should take a close look at the new Sony RX100 VI professional pocket camera. 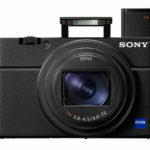 Sony introduced the first RX100 back in 2012 and it was immediately embraced by professional photographers who wanted a serious camera they could carry in a pocket. 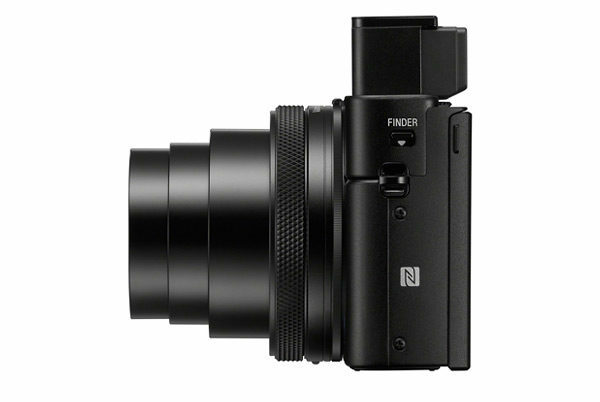 The original RX100 had a 20-megapixel 1-inch sensor that set a new bar for pocket camera image quality; and a very fast f/1.8-4.9 28-100mm zoom lens. The combination of pocketability, great image quality and a bright lens made it the obvious choice for serious photographers who wanted a point-and-shoot camera that could handle all kinds of subjects and conditions. The 1-inch sensor is now the standard for premium compact cameras, offering what I think is the best balance of size vs. quality. There are compact cameras with larger, better sensors but they either don’t fit in a pants pocket and they don’t have zoom lenses. The main barrier between me and the RX100 has always been the short 28-100mm zoom lens. A lot of people love that lens. But personally, if I’m only going to have one lens, it better have some reach. The 24-200mm zoom on the new Sony RX100 VI is a game-changer for me. It’s not quite the 10x or longer zoom range I’d like; and with an f/2.8-4.9 aperture, it’s not as bright as the previous model. But for me, it’s a good compromise – especially since the camera basically stayed the same size (it’s less than 2mm thicker). 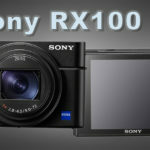 It has all of the video performance I coveted in the RX100 V and they even improved the auto focus performance some more. 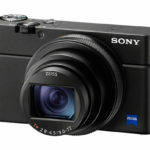 It has the same 35-point auto focus array as the previous RX100 and auto focus speed is approximately 30% faster. Combined with 4 stops of optical image stabilization and that wide zoom, the Sony RX100 VI is a hell of a pocket travel camera. 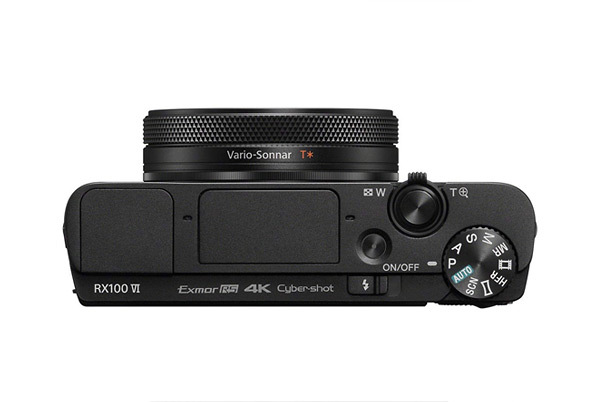 If you’re a video pro, the RX100 VI will outperform a GoPro in nearly every way. Unless you’re shooting actual POV action videos, the RX100 VI is a much better compact video camera with a better sensor, a better lens – and it’s a great still camera. 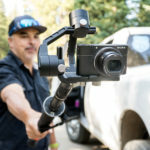 Add a gimbal and you’ve got the ultimate compact travel video rig, capable of filming everything from POV walking tours to action sports video. 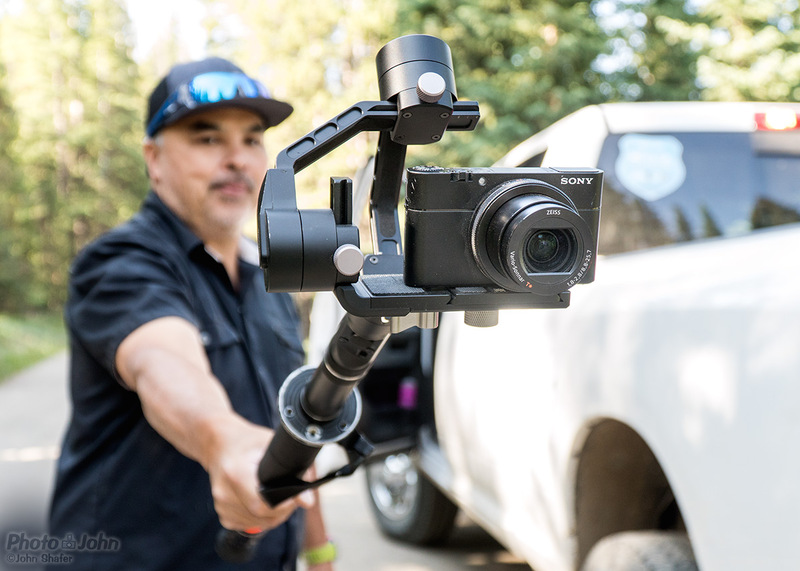 My buddy Byron Swezy, who runs a high-end multimedia agency, with his Sony RX100 V, mounted on a gimbal. 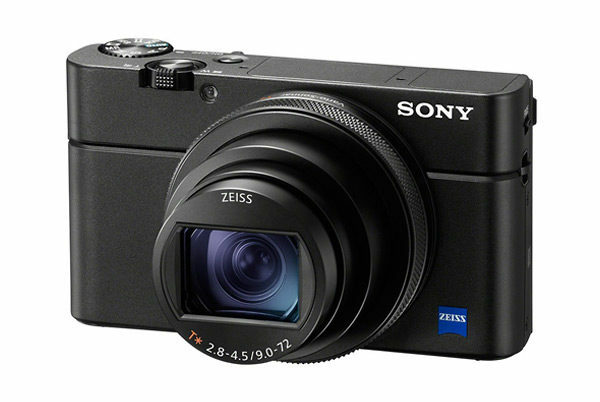 At $1199, the Sony RX100 VI is priced out of reach of most people – including me. 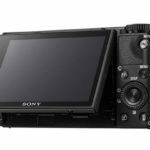 Sony has never had any qualms about premium pricing when they introduce a camera that outperforms everything else on the market. And the RX100 VI certainly fits that bill. However, if you’re looking for a no-compromise travel camera with extraordinary video that fits in a pants pocket, nothing comes close. 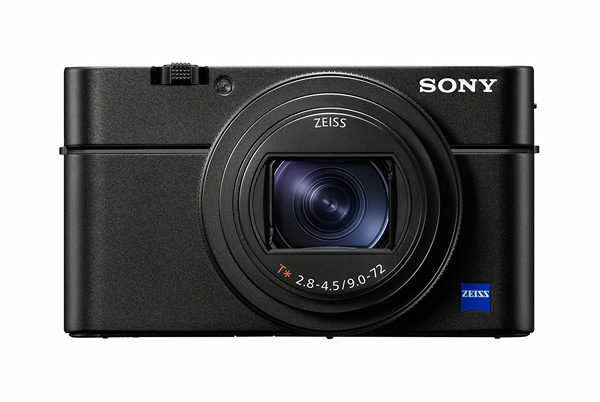 Next time I update my Point-and-Shoot Buying Guide, the Sony RX100 VI will be at the top of the list. 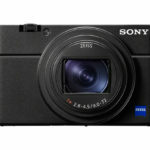 If you’re interested in the Sony RX100 VI professional pocket camera but the $1199 price tag puts it out of reach, there are other more affordable options. 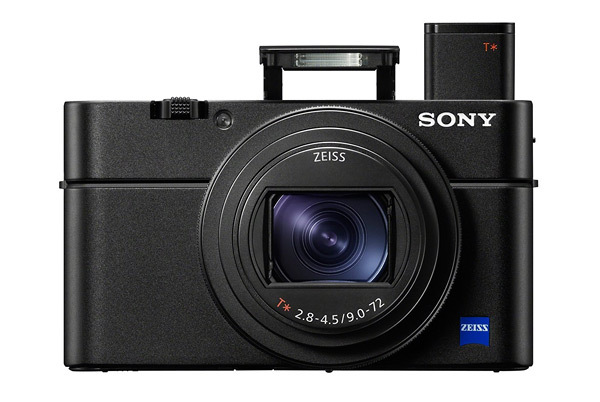 Sony still sells previous versions of the RX100; making it sort of an a la carte camera where you can choose the features you need at a price that fits your budget. There’s also the Panasonic Lumix ZS200 I mentioned earlier. If you don’t care about the RX100 V and VI’s high-end video features, the ZS200 offers comparable image quality with a much longer zoom for hundreds of dollars less. There’s also the Canon PowerShot G7X Mark II, which has a 1-inch sensor and a longer, wider zoom than the original RX100’s 28-100mm lens. 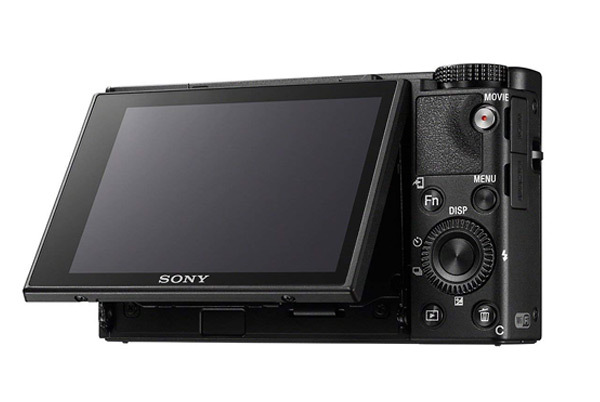 Read my Point-and-Shoot Camera Buying Guide to learn more about all of these cameras. And don’t forget to use the red links to shop on Amazon. 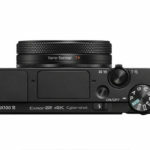 The shopping links on this site pay for the time I invest in these camera articles and camera buying guides. Using those links to buy ensures I can continue sharing my photography experience, camera opinions and shopping advice.